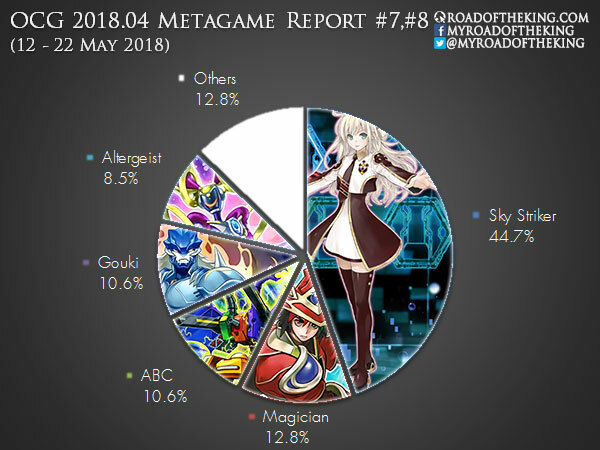 Welcome to Week #7, #8 of the OCG 2018.04 format. 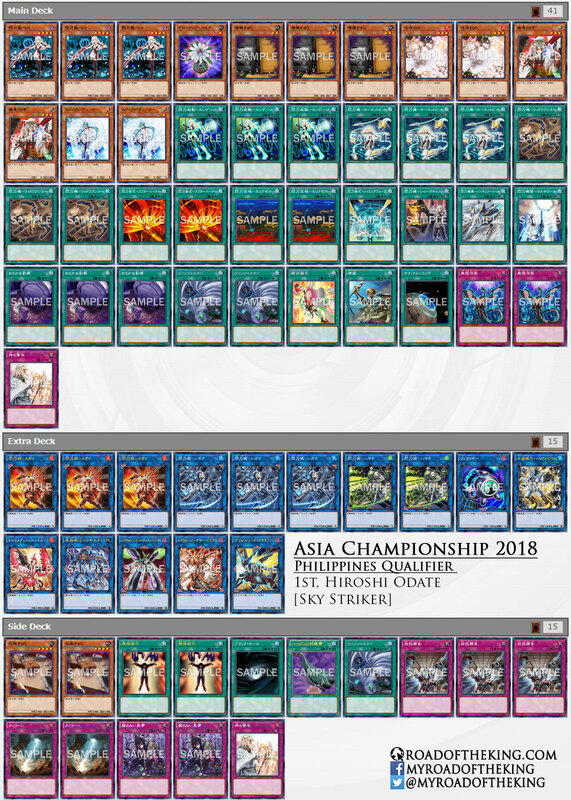 This report will cover 47 top-performing decks from 6 tournaments that were held in Japan, China and Philippines during 12 – 22 May 2018. The biggest tournament happened over the past weekend was the Asia Championship 2018 Philippines Qualifier which had 150 participants. Hiroshi Odate (5 – 8th, Asia Championship 2017) went 10-2 to win the Philippines Qualifier and earned his invitation in the Asia Championship 2018. He played a hybrid variant that runs both Foolish Burial Goods and Sky Striker Airspace – Area Zero. 3 Foolish Burial Goods and 1 Metalfoes Fusion are used to quickly fill the graveyard with Spells in order to hit the 3 Spells quota and provide a simple card draw. 2 Sky Striker Airspace – Area Zero, 1 Terraforming and 2 Twin Twisters are played for additional consistency in bringing out Sky Striker Ace – Raye. Area Zero and Twin Twisters are also useful for sending Metalfoes Fusion to the graveyard in the unfortunate event that it was drawn. 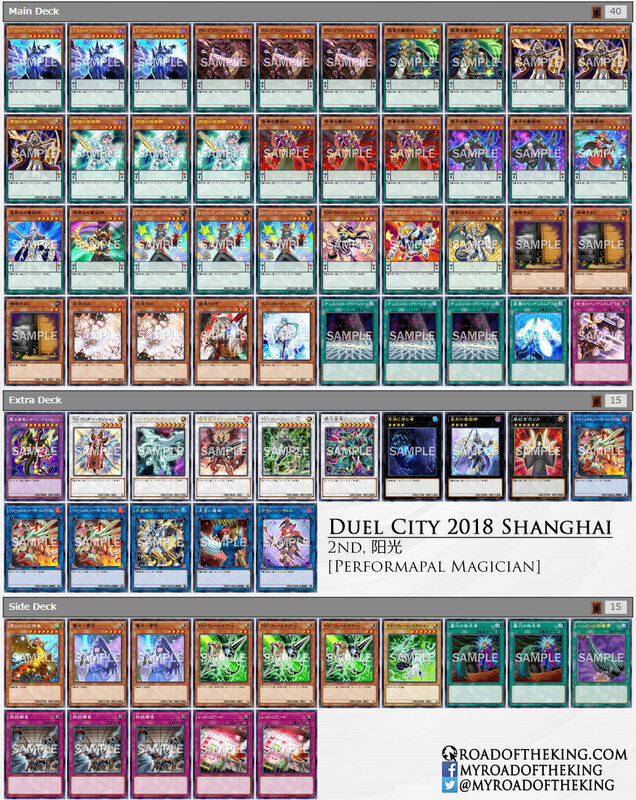 Yang Guang (阳光) went 7-2-1 and finished 2nd in “Duel City 2017 Shanghai” which had 84 participants. He ran a standard optimized Performapal Magician build. Tsujimura Ryosuke “ひつじ”, the 2017 World Champion, was recently spotted playing the Greener HERO ABC FTK deck. He went 6-0-1 and finished 1st in “1st Shimokita CS” which had 29 participants. Rather than just banking only on the FTK, he went for a more balanced build by bringing back Knightmare Gryphon into the Extra Deck, and having the Shaddoll engine in the Side Deck. 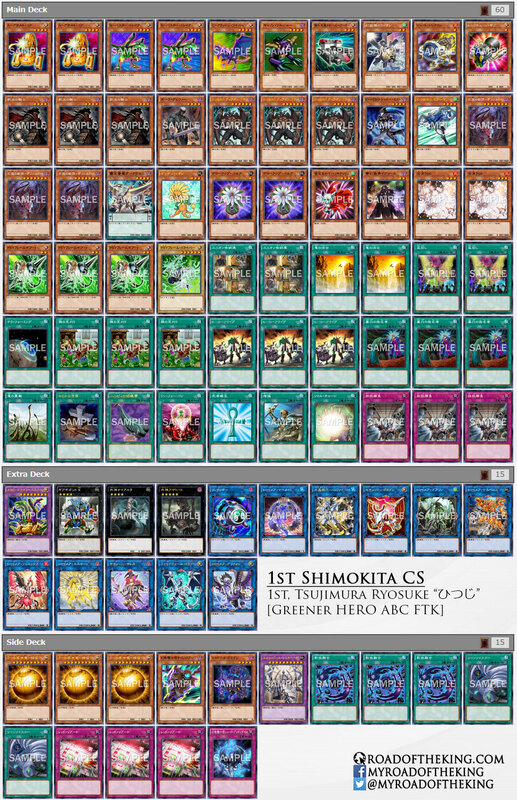 Shiratsukusu (しらっくす) went 6-0 and finished 1st in “43rd Oretachi Trading Card Division CS” which had 31 participants. 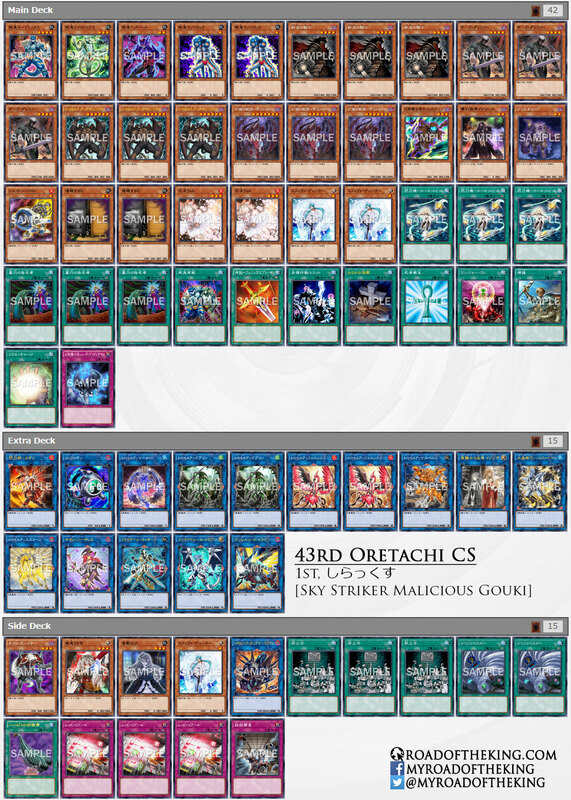 Sky Striker Malicious Gouki has been gaining popularity as it requires fewer cards to setup an Extra Link lockdown. The standard 1-card opening is using Armageddon Knight to send Destiny HERO – Malicious, whose effect would Special Summon another Malicious. Armageddon Knight and Malicious are used to Link Summon Isolde, Two Tales of the Noble Knights, which would add a Warrior monster to hand to be used as discard fodder later, and then send Divine Sword – Phoenix Blade to the graveyard to Special Summon Gouki Octostretch. Isolde and Gouki Octostretch is then used to Link Summon Summon Sorceress, and Octostretch will add another Gouki monster (such as Gouki Suprex). The graveyard effect of Malicious will bring out the final third Malicious under Summon Sorceress‘s Link Arrow, allowing Summon Sorceress to target it to Special Summon The Phantom Knights of Silent Boots. Malicious and Silent Boots will become Knightmare Goblin. The graveyard effect of Silent Boots will fetch for The Phantom Knights of Shade Brigandine, which can be set and activated immediately to Special Summon itself as a Normal Monster. Summon Sorceress and Shade Brigandine will then become Firewall Dragon. This opening will typically finish with an Extra Link consisting of Tri-Gate Wizard, Borrelsword Dragon and various Knightmare Link Monsters, while giving Knightmare Corruptor Iblee to the opponent . An alternative opening is to go for Topologic Gumblar Dragon to discard two cards from the opponent’s hand during your turn. During the opponent’s turn, the Quick Effect of Linkuriboh will Special Summon itself to a Monster Zone beside a Link Arrow, triggering Topologic Gumblar Dragon to discard another two cards from the opponent’s hand. It is nigh impossible for the opponent to mount a comeback especially with Tri-Gate Wizard negating one of their two remaining cards. The Japan World Championship Qualifier (WCQ) is held in 3 Stages – Stage 1: Shop Representative Tournament, Stage 2: Block Representative Tournament and Stage 3: Japan Representative Tournament. The Stage 2 Block Representative Tournament was held over the weekends of Week #7 (12, 13 May) and Week #8 (19, 20 May). This resulted in significantly lesser tournaments over these 2 weekends as many Japanese players were busy playing in their respective Block Representative Tournaments. 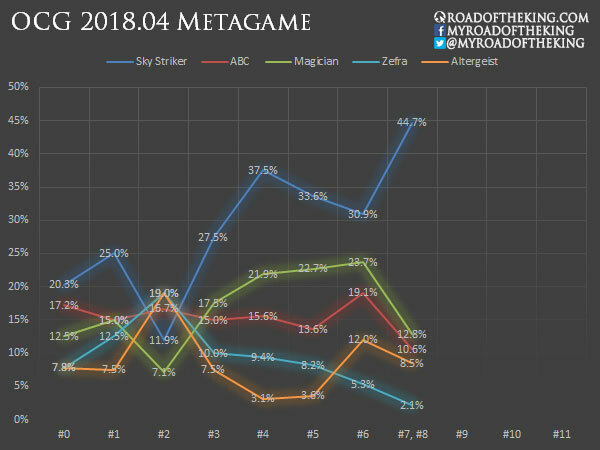 Sky Striker is the primary deck of choice for this WCQ season. The Philippines Qualifier saw a similar result as YOT Thailand 2018, with multiple Sky Striker making the top cut of the tournament, and then winning the tournament altogether. Magician continues to perform well in China, but they have been losing popularity in the other regions. Running Destiny HERO – Malicious in ABC and Gouki is now the newest trending build for setting up an Extra Link lockdown. Thank you to all the supporters on Patreon for making these Metagame Reports possible. Oh yes, uploaded the wrong image there. Fixed and thank you. I’m not sure about the effect of HERO engine in the ABC FTK deck, since it doesn’t have Isolde. Is there some articles introducing the combo? By the way, will you write a article about the Malicious Gouki combo in detail? I’m curious about how to get to the two different opening after summoning Firewall Dragon. For ABC, the HERO engine is basically just for A Hero Lives + Tuner for Crystron Needlefiber. A Hero Lives will Special Summon Elemental HERO Stratos or Elemental HERO Shadow Mist, and their effect would add Destiny HERO – Malicious to hand. The rest is pretty similar Needlefiber → O-Lion → Summon Sorceress → B-Buster Drake. Malicious is discarded for Knightmare Goblin‘s effect, and that will let us go into Firewall Dragon. For Gouki, the 1-card combo is a little conditional. To be more accurate it should be a 2-card combo where the 2nd card is a monster card we hold on in hand for Firewall Dragon‘s effect. But if we are keeping it strictly as a 1-card combo, then we will need a bit of luck to draw into a monster card for Knightmare Mermaid‘s effect, and that would then allow us to trigger Firewall Dragon‘s effect. The HERO engine is for making Outer Entity and protecting the FTK combo from handtraps. In the Gouki deck, you wrote “use Armageddon Knight and Armageddon Knight to link summon Isolde”. what’s the full armageddon knight combo? Excuse me but I think you’ve miss some tournaments that were held in Taiwan, the qualifier of Asia championship Taiwan qualifier in 5/12, 5/19 and 5/27, with 120, 304 and 150 participants respectively. That would be great, if you don’t mind. Would you happen to have the results and deck lists of last Sunday’s Taiwan Main Qualifier? Will you guy make a post showing these gouki and/or ABC combos?